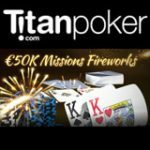 Win prizes in the Titan Poker Twister March Madness with more than €250,000 in Twister Poker tokens and tournament entries to be claimed. 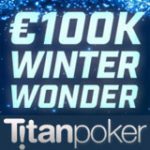 Login to your TitanPoker account after the 1st March to see what prize you have won, prize will be available to all players that have earned at least one point on TitanPoker. Players could randomly win up to €50 in Twister tokens or Twister March Madness tokens, in some cases players could win both. 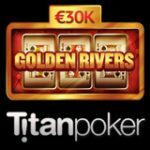 This March Titan Poker is giving away for than €250,000 Twister Poker tournament tokens to all real money poker players. 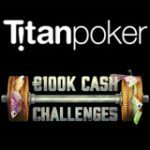 If you have earned one point or more at TitanPoker you can login to the lobby after the 1st March to get your free prize. The surprise gift is randomly awarded and players will win either or both of the following: Twister Poker SNG tokens or a Twister Madness tournament token. Claim your Titan Poker Twister March Madness prize. 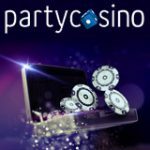 Twist Again token or package with up to €50 in Twister Poker SNG tokens, play the new jackpot SNG game of the buy-in amount of the token value. Twister Madness tournament tokens are valid for the weekly €750 Twister Madness shootout tournament. 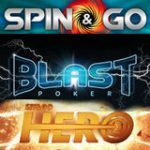 The Twister Madness shootout tournaments are running every Monday night in March with €750 prize pool plus the top 27 players in each tournament get tickets to the €2,000 Twister Madness Final tournament. Players can also get their seat to the €2,000 Twister Madness Final tournament by making a deposit of at least €40 between 1st - 29th March. Twist Again tokens or packages feature up to €50 in Twister Poker tokens players can win a random jackpot prize pool up to 1,000 times the token value. 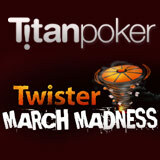 Player could randomly receive a Titan Poker Twister March Madness token or a package when logging into the TitanPoker after 1st March.